Antagonists. Obstacles, Villains. Foils. Impediments. Call them what you will, but a great campaign needs opposition to create stirring conflict. 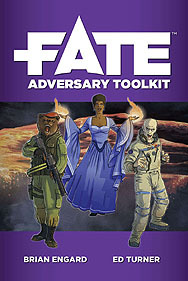 The Fate Adversary Toolkit offers a variety of ideas, mechanics, and hacks to help you make the most out of every obstacle in your game. Explore what an adversary is in Fate terms, and always remember that everything is a character. Inhabit hostile worlds and situations that work against the players. Face down mooks and big bads built to provide high stakes drama and engage everyone at the table. Learn how to use high quality adversaries to drive your stories to completion. New categories of adversaries (enemies, obstacle,s and constraints), each with their own rules, functions, and samples. A Rogue's Gallery full of sample adversaries separated by genre, with ideas on how to use the characters and settings provided to create plot.